Welcome to Dustless Duct. What you'll find here is honest air duct cleaning at affordable and competitive prices. Just the quality cleaning job that you deserve. The dirt you can see in your vents is just the tip of the iceberg. When indoor air circulates through the air ducts, it brings with it dust, dander, and other allergens. These particles end up lining the duct walls. If they are small enough, they may also pass through the filter to the heating or cooling unit, where dirty parts can degrade performance and damage the equipment. Air duct cleaning is highly recommended after new construction or renovations, or after flooding that affected the duct system. When moving to a new home or office, air duct cleaning will remove any smells or contaminants left behind by the previous tenants or owners. 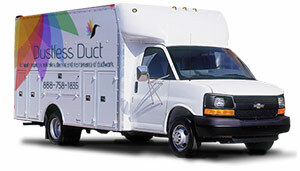 Call Dustless Duct now to schedule your free inspection. Indoor air pollution affects indoor air quality, causing sneezing, coughing, itchy eyes, congestion, headaches, fatigue, nausea, and dizziness. A dirty HVAC system works harder than a clean HVAC system. Air duct and HVAC cleaning can reduce your energy bills. Indoor air pollution is one of today's biggest problems. Luckily, there are ways to improve the indoor air quality in your home or office. Office buildings and retail establishments can have a lot of indoor air pollution. Reduce employee absenteeism with commercial duct cleaning services. Dustless Duct offers a full range of chimney sweep services to clean, repair and maintain the chimney and fireplace assembly. Dryer Vent Cleaning by Dustless Duct can help reduce the risk of fire due to dangerous dryer lint buildup.